Rick Thomas invites his readers to enter into a place for “mature audiences” only, to listen as he recounts the darkest time in his life and how, through his journey of intense suffering, he was led to spend four years in the Book of Job. What he discovered was that the book wasn’t really about Job (the most famous sufferer of all time) – but about God, and in particular – about learning to trust God in all our circumstances. 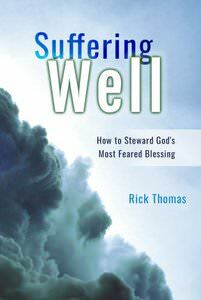 This book is especially rich with biblical references to support his conclusions on why we are “called” to suffer.